In honor of grilled cheese month I wanted to share a new grilled cheese recipe that a found in a magazine at the library(my version anyway). 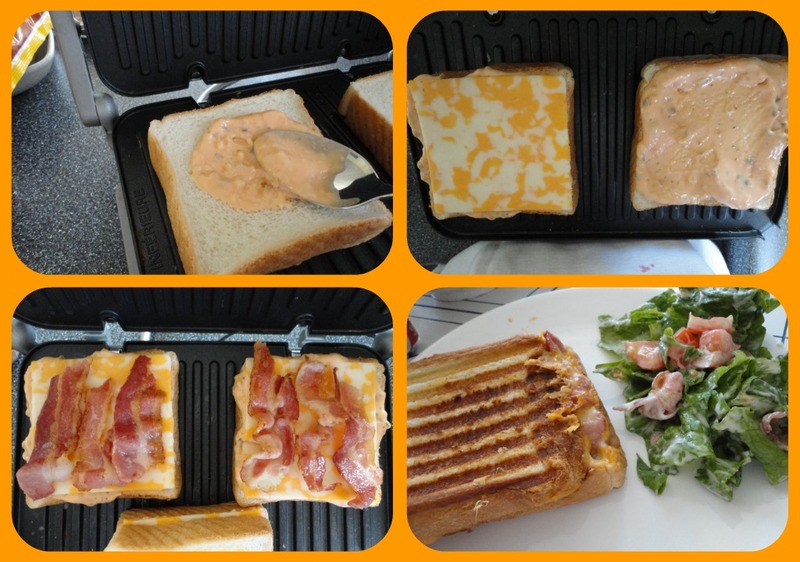 It was a big hit and I will most definitley be making them again and its a good excuse to get to use my panini maker. The bacon salad I made along with it not only used the rest of the bacon, but tasted great with the sandwich. If you have leftovers you might want to cut the sandwich in 1/2 because it makes a big sandwich. Melt butter and brush it on the outside of bread. Lay butter side down. Combine all ingredients and toss together. I went to Tom + Chee and had the grilled cheese with bacon and Grippo BBQ chips – delish!